Once a quiet harbour town on Ireland's north coast, it’s hard to believe that it’s been nearly 8 years since the beautiful Ballintoy found itself in the middle of the Game of Thrones filming frenzy. Visitor numbers quickly surged and now a steady troupe from near and far come to check out the fictional ‘Pyke’ - capital of the Iron Islands in the HBO hit. It's great to see the various tours and activities now on offer, for Game of Thrones geeks like ourselves to experience the fictional world. But give yourself more than a couple of hours in “Baile an Tuaigh” (Irish for Ballintoy, meaning 'northern townland') and you’ll quickly realise there’s so much more to see and do. Get yourself to Lonely Planet's “Best Region to Visit in 2018”* (i.e. the Causeway Coastal Route) - Ballintoy is right next to the entrance for Carrick-a-Rede Rope Bridge, about halfway between The Giant’s Causeway and Ballycastle. ^Approaching Ballintoy from Carrick-A-Rede. Ballintoy Church to the right, Giant's Causeway cliffs in the distance. Our base for exploration this weekend. We’ve stopped off for food and drink in Ballintoy’s popular pub/restaurant numerous times over the years (e.g. here and here) and each time saying the same thing - next time we're staying over. 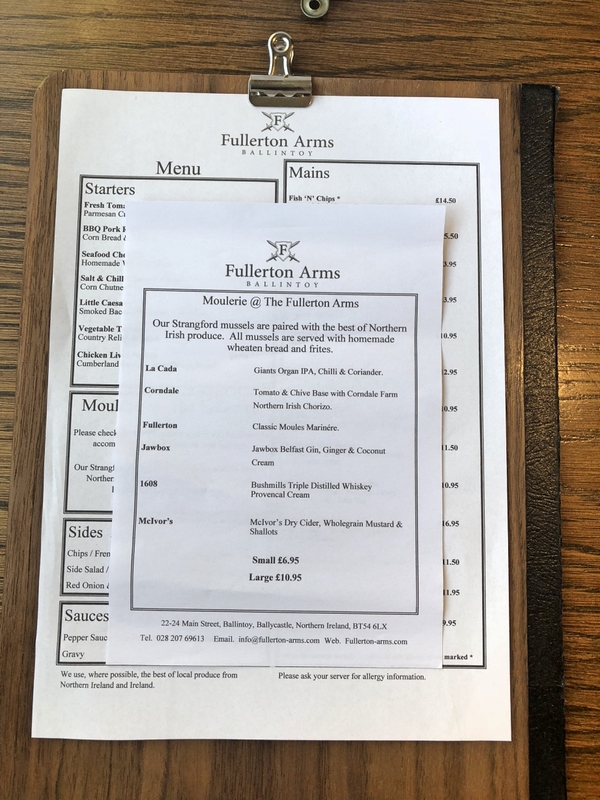 FINALLY, thanks to owners Sean & Geraldine, we did - they kindly invited us to come check out the accommodation after a recent significant revamp. While the exterior keeps its renowned characteristic charm – with its very own Game of Thrones door entrance to the dog-friendly and award-winning bar/restaurant – the rooms and connected hallways now boast a plush, contemporary look and feel. Similar to our Fullerton stay-over goals, for a long time it's been on our list to explore the Causeway Coast from the water. So, following a few calls the week previous, shortly after checking-in we were pushing kayaks into the water for an afternoon with Anne from Causeway Coast Kayaking Tours. 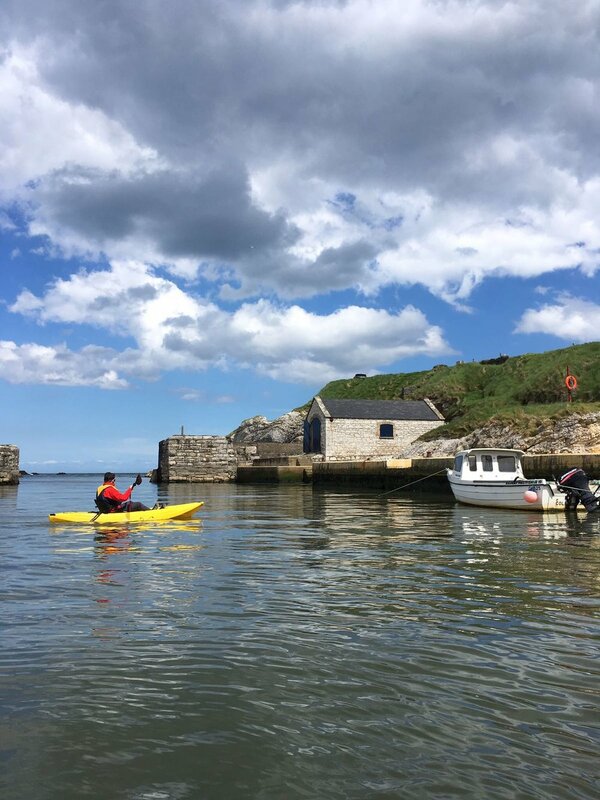 While the still waters of Ballintoy harbour were perfect for us to ‘find out feet’ in the kayaks, once out in open water we quickly knew our jaunt would be dictated by the weather. We managed about 20 minutes of paddling before the anticipated wind picked up and the swell increased the chances of us taking an unwanted plunge. A spade was called a spade, we agreed to give it a go again tomorrow morning and back to land we went (*video of attempt 2 further below). ...you’ll eventually end up in an area that looks like it was carved by the legendary giant Finn McCool…if he was into skateboarding/BMX’ing that is. Can you see the elephant in the water, in the distance? Elephant Rock - see it? Back to the Fullerton Arms we went for the tasty food and drink that had been on our minds all day. 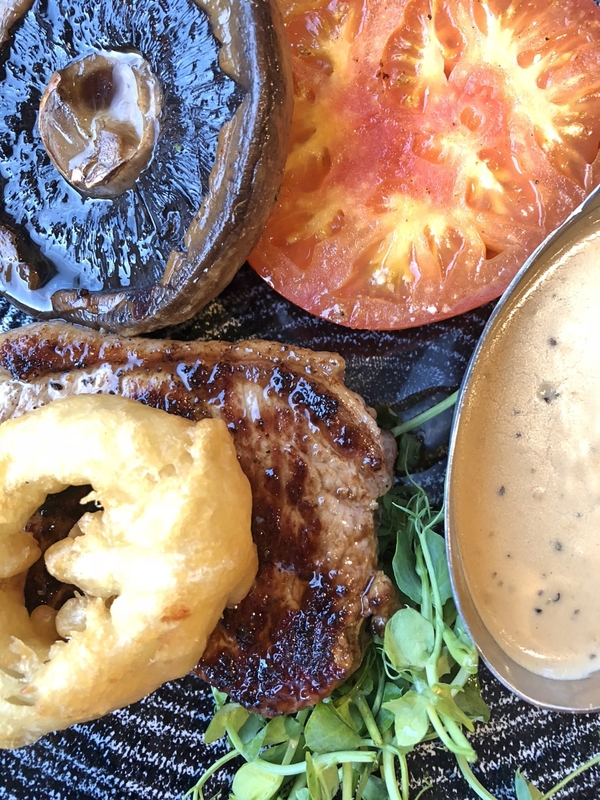 Being a few minutes away from ‘hangry’ mode, I played it safe and went for the Rump Steak from the specials menu. C on the other hand was feeling adventurous - willing to stray from the usual Moulerie (muscles) choice of the McIvor’s Dry Cider, Wholegrain Mustard & Shallots… this time opting for the Jawbox Belfast Gin, Ginger and Coconut Cream. And as usual, everything was superb. Staff were tentative and in good spirit. For our Sunday morning attempt, we met up in Ballycastle. Chatting with Anne the previous day, we realised it was possible for us to check out one of our other north coast favourites - Kinbane Head which lies about halfway between Ballycastle and Carrick-a-Rede. ...yes, those were heavy, heavy hailstones. After drying off from the kayaking, we ended our trip with a look around Ballintoy’s other famous landmark - the 200 year old white church and its epic sunset views.